Wayward Wonders is an open world “Complete the Monument” map with elements of both survival and adventure. The player(s) must explore the land to defeat the evil bosses that have taken over the Wonders of the world. There are two monuments: The Adventure Monument (12 blocks) and the Wool Monument (15 blocks). Each block of the Adventure Monument is tied to a major location on the map. At each location is a beautiful Wayward Wonder of the World that has fallen to forces of evil. The player(s) must defeat all foes and return all the blocks to the monument to cleanse the land and the Wonders that stand upon it. Completing the Adventure Monument allows the player(s) to access the final battle and block. Each placed Wool Block gives the player(s) a random bonus reward item of high value. Wool Blocks are also tied to random locations scattered across the map. Pick a direction and go! 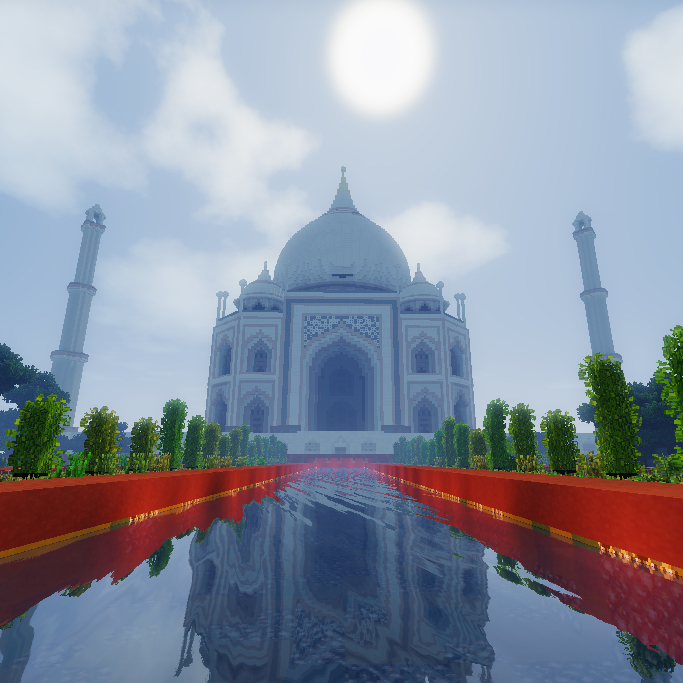 The map is designed to be vanilla Minecraft but with random events and amazing locations to discover. No single playthrough will be the same, and every player’s experience will be different (think Skyrim or Fallout style, but in Minecraft). You will not find all the special items or secrets, but that is the point. Some will take a few hours to play the map and some will be at it for several weeks. Make it what you want. The map is made up of several landmasses. The Wayward Desert is dry and brutal. Water, soil, and trees are extremely rare and tough creatures are everywhere. The other continents are not nearly as dry but have their own challenges. Wayward Wonders, Wool locations, dungeons, temples, villages, and Spirit Stones are scattered across the whole map, in no particular order. -To-scale Ancient Wonders of the World! There's also a wall around the playable area. The sky turns black if you're getting close. -Command Blocks = Must be enabled! -Difficulty = Normal is locked! 1. Refer to the map if you need some guidance. 2. Buy Ender Chests and take advantage of them. 3. Buy coordinate books if you’re really struggling. 5. Ask any and all questions you have in this thread. 6. Post any and everything you want here, if it involves the map. 7. If you encounter a bug, let me know. They are usually easily dealt with. 2. Be undefined. It’s a big file. 4. Place the resulting folder into your “saves” folder. -Feel free to make videos and monetize them. Making money in any other way is strictly forbidden. -Give proper credit and link to this page. -Do not claim the map or anything in the map as your own. -DO NOT RE-UPLOAD, mirror, or directly link to the map or any content within it. Link to this thread only. -I am not responsible for any damage associated with use of this map. Responsibility for any damage done falls to the user. OWNER - , Original author of the MAP. Under the copyright terms accepted when purchasing Minecraft (http://www.minecraft.net/terms) the OWNER has full rights over their MAP despite use of MOJANG code. Do NOT use any builds or images in other projects or media without my permission, without credit, or without linking to this thread! This map and the structures on it are the result of tons of work and effort. Do NOT redistribute anything in the map without my prior permission. Thank you! Want to donate via PayPal? Send me a private message! Want to get involved? Have an idea? Send me a private message! can this be played on the windows 10 version yet?